Most people are familiar with the term R-Value when discussing insulation properties. An R-Value is a measure of an insulation product's resistance to thermal heat transfer. It's a measure of how long it takes a heat "absorbing" product to absorb 100% of its potential and begin to transfer that heat out the other side of the product. Basically, a product with a higher R-Value is better than a simliar product with a lower R-Value. A higher R-Value product takes longer to absorb 100% of it's potential and therefore, is more effective at "delaying" the transfer of heat. R-Values themselves don't mean much alone unless they are used to compare the effectiveness of different R-Value rated products. by REDUCING the emission of heat from its surface across an air space. Installing a radiant barrier between a source of heat and an existing R-Value rated insulation will improve the effectiveness of the R-Value rated insulation. Why? 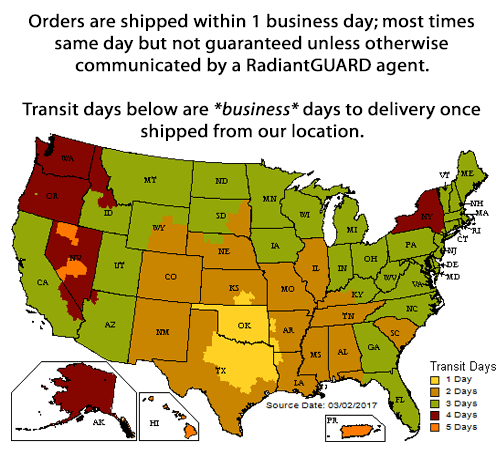 Because our RadiantGUARD radiant barrier reflects 96% of the radiant heat which means only 4% of the heat is now hitting the R-Value rated insulation and therefore, it will take longer for it to absorb 100% of it's potential thereby holding the heat longer before passing the heat out through the other side. a radiant barrier combined with an R-11 insulation has the same affect as an R-19 insulation alone. a radiant barrier combined with an R-19 insulation has the same affect as an R-30 insulation alone. The Florida Solar Energy Center specialist Philip Fairey found that a radiant barrier combined with an R-19 insulation produced a LOWER peak energy demand than an R-30 insulation alone.